The Process Days have grown in six years as a top Service and Process Management event in Finland. The Process Days focus on the trends and visions of service and process management without forgetting the actual everyday work. The goal is to show what’s new and coming in the field of service management and what’s been done now and how. To provide ideas and actual concrete takeaways. The 2018 Process Days are constructed around three themes: automation, artificial intelligence and digital future. Service and process management is considered from the perspective of selected themes. Process days offer great opportunities meet current and future customers, create contacts and new networks. Welcome to the Process Days! Service Automation is the concept of achieving customer loyalty by the use of automated technologies and builds upon a large demographic and sociological trend. As a society, we have become accustomed to arranging our lives online and expect services that can match those expectations. Service Automation helps to arrange our lives online. This session will give you deep insight into the concept of Service Automation, the concept by which you can automate your service offering. If you adequately apply Service Automation in your organization, you will see both employee and customer satisfaction rise and significantly increase the number of people who will ‘like’ your company. The Service Automation Framework book and corresponding SAF Certification Scheme has been created to find a methodical way to discuss Service Automation. Launched in 2017, the Service Automation Framework provides a step-by-step approach, including a number of design elements and processes, which every organization can use to systematically enhance its Services. As with any model, it is a simplified version of reality, but it structures the mind and provides uniform terminology when discussing the contents with co-workers and colleagues. 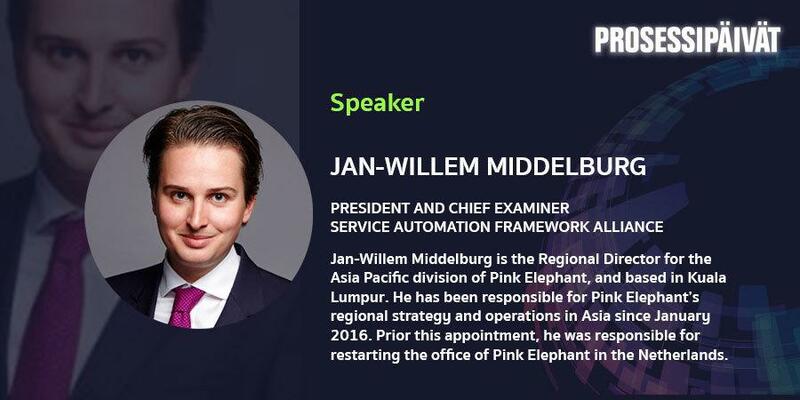 Jan-Willem Middelburg is the Regional Director for the Asia Pacific division of Pink Elephant, and based in Kuala Lumpur. He has been responsible for Pink Elephant’s regional strategy and operations in Asia since January 2016. Prior this appointment, he was responsible for restarting the office of Pink Elephant in the Netherlands. In 2016, Jan-Willem published the Service Automation Framework for the design and delivery of automated services, which is internationally considered the leading publication on service automation. As author of the book, he is a frequent keynote speaker and moderator at universities and technology conferences around the world. Jan-Willem holds a degree in industrial engineering and a master’s in supply chain management from the Rotterdam School of Management.